In his bestselling missional book The Forgotten Ways, internationally known missional church expert Alan Hirsch offered a vision for the future growth of the church coming about by harnessing the power of the early church. 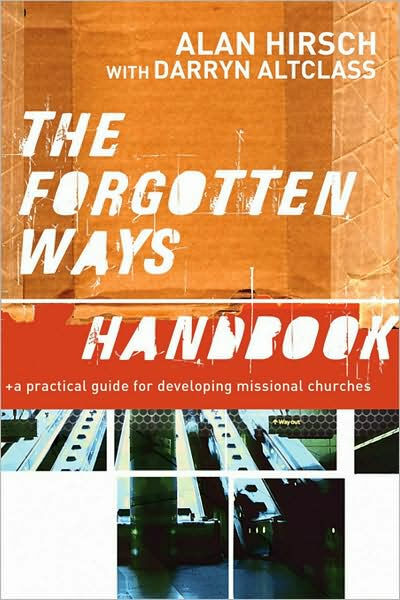 The Forgotten Ways Handbook now moves beyond theory to practice, offering ways for any missionally minded person to apply the ideas contained in The Forgotten Ways to their life and ministry. This intensely practical handbook includes many helpful tools: summary sections encapsulating the ideas contained in each chapter in a popular way; suggested practices to help readers embed missional paradigms concretely; and adult learning-based techniques and examples from other churches and organizations that enable readers to process and assimilate the ideas in a group context. Alan Hirsch is the founding director of Forge Mission Training Network and a sought-after speaker and trainer who travels the world extensively sharing his missional church experience. He is coauthor of The Shaping of Things to Come: Innovation and Mission for the 21st-Century Church. Darryn Altclass is a practitioner with direct, current experience in initiating and developing the incarnational approach in difficult social settings in Australia. The Forgotten Ways Handbook by Alan Hirsch; Darryn Altclass was published by Brazos Press in June 2009 and is our 27176th best seller. The ISBN for The Forgotten Ways Handbook is 9781587432491. Here is another book which takes the reader / church leader through a process of moving a church from maintenance to mission, and looks, I think, one of the best around. It has a detailed programme but open approach; it is not English but speaks to the English church well; it facilitates a 'bottom up' approach, while offering leadership from the front. It will be a helpful resource book. Group sessions and reflections help to make this a spiritual journey even though a key is the action learning model which is used to facilitate new ways of thinking. Although Australian, I think this work will be well read and the principles applied to the UK context. The process emphasises the heart of church and mission being Jesus, the task of making disciples, with the mission impulse being incarnational. Nothing new you might think, but the exploration is helpful as often 'forgotten'. Do read. Got a question? No problem! Just click here to ask us about The Forgotten Ways Handbook.